The Afghan's long silky coat is an adaptation to the extreme conditions found in the high elevations of its native region. This breed possesses a highly independent nature. 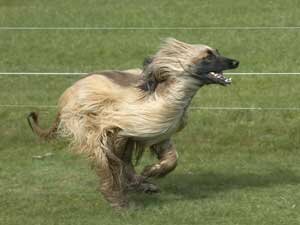 This is a guide about Afghan Hound breed information and photos. 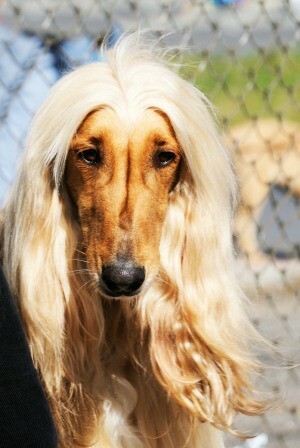 Breed Description: The tall, silky-coated Afghan Hound has an elegant, noble appearance that commands attention. This breed possesses a highly independent nature, but has a sensitive and affectionate demeanor with its immediate circle of companions. Group: Hound Group. A gaze or "sight" hound-uses sight to track, hunt and kill prey. Purpose of Breed: Originally bred for hunting gazelles and wolves, guarding and protecting villages and flocks, and herding livestock. Color(s): All colors, including several combinations. Coat Type: Long and silky along the body except the back saddle area and forward from the brow on the head. Grooming: Afghan Hounds are renowned for their long silky coats that require dedicated grooming to maintain. The hair has to stay on the dog for a long time in order to grow to its full length; they are not seasonal shedders. They have very little oil in their coats so do not have doggy odor. This breed requires standard care for eyes, ears, pads and nails. Exercise Needs: These dogs are high-strung, athletic and extremely fast. They require lots of daily exercise. Because of their speed and ability to jump, they should not be allowed to run loose except in areas enclosed with sufficiently high fences. Temperament: Afghan Hounds were bred with the ability to make decisions on their own, a characteristic they have maintained over centuries. This can make them aloof and prone to ignoring requests. They are lively and affectionate companions around their family and best suited to homes that appreciate their spirit and are committed to maintaining their appearance. Health Issues: Juvenile cataracts, some allergies, bloat, sensitivity to anesthesia and a progressive paralysis unique to the breed. Trivia: The Afghan's long silky coat is an adaptation to the extreme conditions found in the high elevations of its native region-cold nighttime temperatures and searing daytime heat. More Information: Afghan Club of America, Inc.
Kahlua is a 2 year old purebred Afghan Hound. I adopted Kahlua during Thanksgiving weekend of 2009. I saw her online at the local SPCA shelter and went to go look at her. I fell in love when I saw her skinny little self behind the cage door, I just had to add her to my family. Well, let's just say it's never a dull moment since she has come into my life. Kahlua LOVES squeaky toys! I think she should be the dog that tests those toys before they go out in the stores, because we have not found one that she can't destory within 5 minutes! She loves to run...all the time! She makes you chase her all around the house just to put her in the kennel. Kahlua is an amazing inspiration to me. She was found on the streets, abandoned by humans. When we brought her home she was severely emaciated, had stickers all through out her long coat, kennel cough and to top it off, she acted like she had been beaten. It took us a year to get her filled out and to gain some of her trust. To this day she is still pretty timid, but she has overcome so much.